Happy 4th of July from Elite Pools of Houston! Are you celebrating the Fourth of July with the whole family? Enjoy the national holiday with some help from your favorite Houston pool builder! Keep your backyard environment festive by getting the kids together to create these fun, pool noodle firecracker decorations. Then, snack on some patriotic cookies while you enjoy the fireworks by your Houston swimming pool! 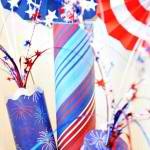 Happy 4th of July from Elite Pools and Spas! Cut your pool noodle to the desire sizes with a serrated knife. I wanted three. Two are the same and one is slightly larger. Measure your scrap paper to fit around the firecrackers. Roll the paper until it wraps back around itself and draw a straight line leaving a little to slightly overlap. Spread Mod Podge on noodle and carefully roll paper onto noodle applying additional Mod Podge if needed to get a good adhesion. Tuck cut edge of paper under factory cute edge to have a nice clean seam. Allow to dry. Cut a circle out of the paper to fit the top of the noodle. Lay circle on top of noodle and poke hole through top with pencil before gluing down. Make sure to match seams up so none of the noodle shows though Allow to dry. Trim with decorative ribbon if desired. Spray with two coats of polyacrylic spray for a water resistant finish. Insert spray into top and through hole in noodle. Trim off any of the end that is below bottom of noodle. Run skewer through bottom of the noodle and into the foam to attach securely. Insert into pot or arrangement of choice. Or you can set them on a table without the skewers. 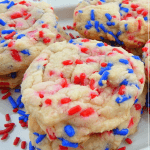 With their red and blue sprinkles, these cookies are as pretty as they are delicious! *Make sure to use the right size of cake mix. Preheat oven to 350 degrees. In a large bowl, mix together the cake mix and baking powder. In a small bowl, mix together the eggs, oil and vanilla. Add the egg mixture to the cake mixture and stir to combine. Stir in the sprinkles. Drop by spoonfuls onto a cookie sheet or silpat. Bake for 10 minutes. Allow to cool for 5 minutes on the baking sheet before transferring to cooling rack. The cookies will be very soft at first. Cool and enjoy!